I have somewhat damaged hair and 2chic Ultra Volume Conditioner with Tangerine & Papaya Butter by Giovanni Cosmetics made my hair feel soft and smell nice. 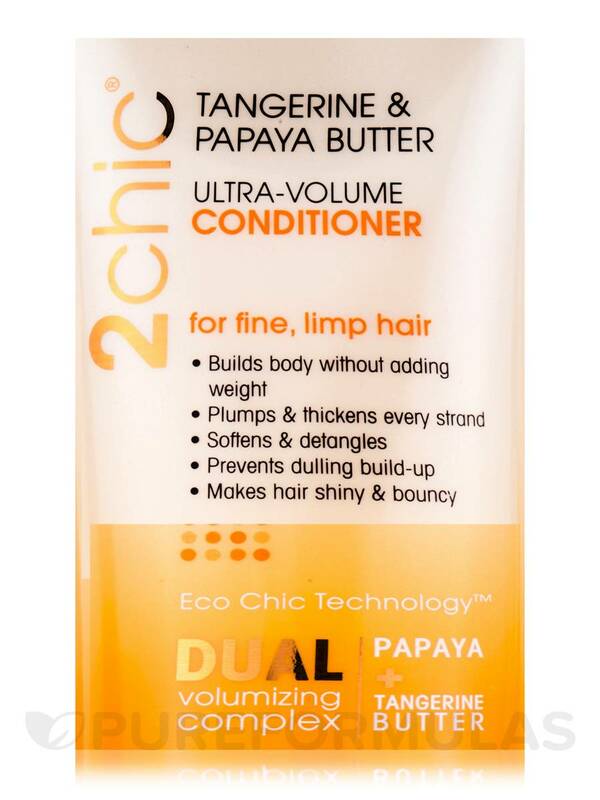 2chic Ultra Volume Conditioner with Tangerine & Papaya Butter by Giovanni Cosmetics is lovely!! 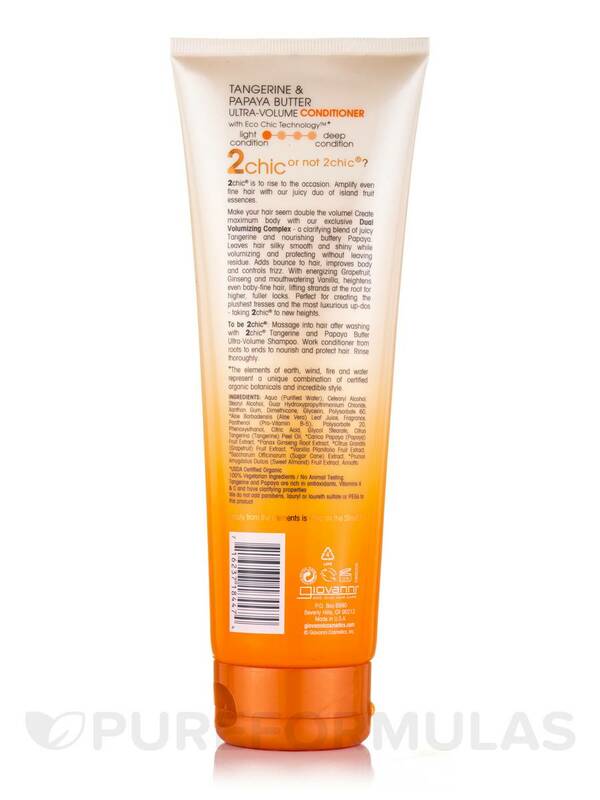 Create maximum body with Giovanni 2Chic Tangerine & Papaya Butter Ultra-Volume Conditioner - a clarifying blend of juicy tangerine and nourishing buttery papaya. 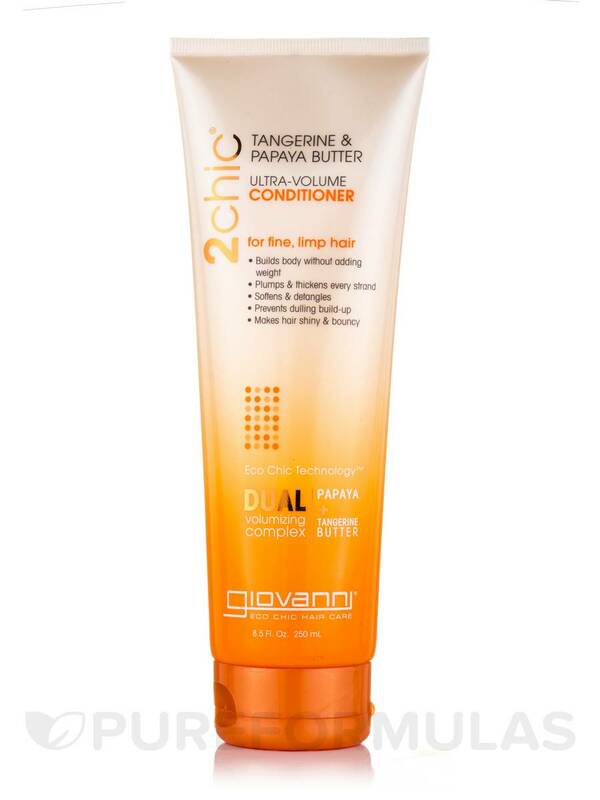 Giovanni 2Chic Tangerine & Papaya Butter Ultra-Volume Conditioner leaves hair silky smooth and shiny while volumizing and protecting without leaving residue. - Builds body without adding weight. - Plumps and thickens every strand. - Makes hair shiny and bouncy. Aqua (Purified Water)‚ Cetearyl Alcohol‚ Stearyl Alcohol‚ Guar Hydroxypropyltrimonium Chloride‚ Xanthan Gum‚ Dimethicone‚ Glycerin‚ Polysorbate 60‚ *Aloe Barbadensis (Aloe Vera) Leaf Juice‚ Fragrance‚ Panthenol (Pro-Vitamin B5)‚ Polysorbate 20‚ Phenoxyethanol‚ Citric Acid‚ Glycol Stearate‚ Citrus Tangerina (Tangerine) Peel Oil‚ *Carica Papaya (Papaya) Fruit Extract‚ *Panax Ginseng Root Extract‚ *Citrus Grandis (Grapefruit) Fruit Extract‚ *Vanilla Planifolia Fruit Extract‚ *Saccharum Officinarum (Sugar Cane) Extract‚ *Prunus Amygdalus Dulcis (Sweet Almond) Fruit Extract‚ Annatto. 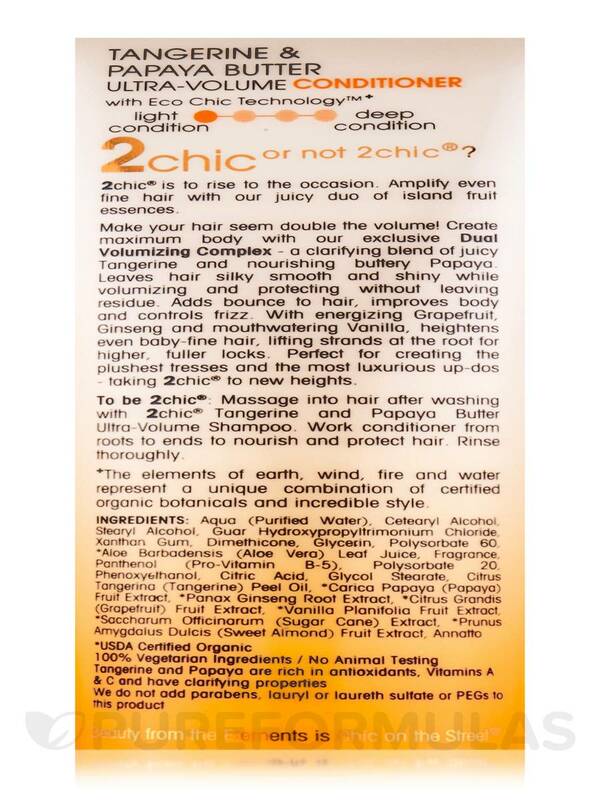 Massage into hair after washing with 2chic® Tangerine and Papaya Butter Ultra-Volume Shampoo. Work conditioner from roots to ends to nourish and protect hair. Rinse thoroughly. 2chic Ultra Volume Conditioner with Tangerine & Papaya Butter by Giovanni Cosmetics provides good volume without weighing my hair down. Needs to smell just a little stronger as smell dissipates when hair dries. Such a nice blend! Love the way it makes my hair look.